Gazette reader Maddie Bould recognised herself from the picture of Lady’s Convent Nursery. She is the little girl with the very heavy fringed hair cut to the right of Gareth Oman and Dan Young, who is sporting the fantastic bowl cut. The girl to the front left was called Kate. Can you help name the remaining children? If you have any pictures we can publish, email Northumberland.gazette@jpress.co.uk or telephone 01665 602234. Or call into the Northumberland Gazette office in Alnwick. 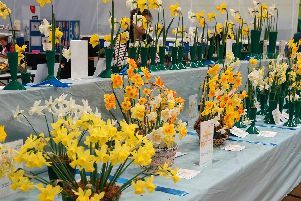 IN PICTURES: Alnwick Spring Show produces a colourful display.